Eliza Reed married Capt. Levi Houghton, son of Thomas Houghton and Betsy White, in Oct 5, 1823 at Roxbury, MA, USA. Relief Gould married John Pierce Houghton, son of Thomas Houghton and Betsy White, in Dec 27, 1821 at Harvard, Worcester Co., MA, USA. Birth Oct 20, 1801 Billerica, Middlesex Co., MA, USA, MLM: Oct. 20, 1808, Harvard MA; Cope: Billerica; Foster, in describing Silas Cragin, Ann's father, says: "He was a saddler at New Ipswich, NH, Billerica, Acton & was in Harvard by 1807, but by 1835 was back at New Ipswich." This rules out Harvard as Ann's birthplace since she was born in 1801. Ann Cragin married Stedman Houghton, son of Thomas Houghton and Betsy White, in Nov 17, 1825 at Harvard, Worcester Co., MA, USA, 1: White; 2- JWH, 11,17,1835. 1860 Census 1860 New Ipswich, Hillsborough, NH, USA, age 60, a farmer; and George Starno, 16; Charlotte Haskill, 12; Alfred Patch, 10. Maria Haskell married Stedman Houghton, son of Thomas Houghton and Betsy White, in Oct 24, 1844 at Harvard, Worcester Co., MA, USA. Aaron Warner Stearns and Betsey White Houghton declared their intentions of marriage on May 17, 1828 Leominster, Worcester Co., MA, USA. Aaron Warner Stearns married Betsey White Houghton, daughter of Thomas Houghton and Betsy White, in Jun 15, 1828 at Harvard, Worcester Co., MA, USA. Luke Joslin and Sally White Houghton declared their intentions of marriage on Jan 16, 1830 Leominster, Worcester Co., MA, USA. Luke Joslin married Sally White Houghton, daughter of Thomas Houghton and Betsy White, in Feb 16, 1830 at Harvard, Worcester Co., MA, USA. James Harvey French and Mercy Whitney Houghton declared their intentions of marriage on Apr 4, 1829 Concord, Middlesex Co., MA, USA. James Harvey French married Mercy Whitney Houghton, daughter of Thomas Houghton and Betsy White, in Apr 30, 1829 at Harvard, Worcester Co., MA, USA, MLM: Concord, MA. Nancy Bryant married Edmund Houghton, son of Thomas Houghton and Betsy White, in Apr 11, 1833. Lucy Houghton married Norman Woodruff. Betsy Houghton married Fayette Herrick in Dec 1, 1814. 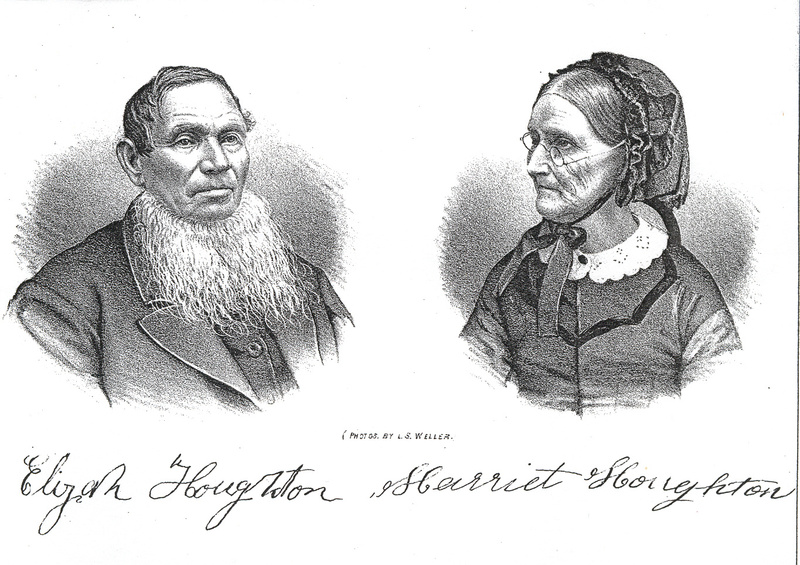 Elijah Houghton Sr married Harriet Dopking in Oct 26, 1826. Mary Houghton married Levi Miller in Jan 1, 1826. Norman Woodruff married Lucy Houghton, daughter of Elijah Houghton Jr and Lucy Haskell. Fayette Herrick married Betsy Houghton, daughter of Elijah Houghton Jr and Lucy Haskell, in Dec 1, 1814. Harriet Dopking married Elijah Houghton Sr, son of Elijah Houghton Jr and Lucy Haskell, in Oct 26, 1826. Antha Holland married Otis Houghton, son of Elijah Houghton Jr and Lucy Haskell, in Feb 17, 1852 at Jefferson Co., NY, USA, JWH: 1866. Levi Miller married Mary Houghton, daughter of Elijah Houghton Jr and Lucy Haskell, in Jan 1, 1826. Ellen M. Miller married Willis Ackerman in Sep 19, 1865. Lydia Miller married Jeremy Weston in Oct 30, 1877. Willis Ackerman married Ellen M. Miller, daughter of Levi Miller and Mary Houghton, in Sep 19, 1865. Jeremy Weston married Lydia Miller, daughter of Levi Miller and Mary Houghton, in Oct 30, 1877.